"In your day there was no career for women except in the unnatural rivalry with men. We have given them a world of their own, with its emulations, ambitions, and careers, and I assure you they are very happy with it"
"I said there was more than one way of living with your head in the sand and that if Moira thought she could create Utopia by shutting herself up in a women-only enclave she was sadly mistaken." 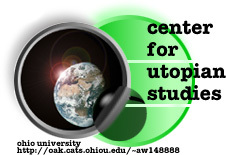 The Center is located at Ohio University, but is composed of ideas and influences from around the world. If you have any good sites of utopian literature or ideas for the construction of this page, drop me a line at [email protected]! Most importantly, if you'd like to contribute to this page, let me know. I will be glad to link to your document and provide an abstract for readers of this page. In no way does this homepage seek to represent the opinions of Ohio University or any other institution or person. It is solely the responsibility of the page maintainer. Any use of copyrighted images and text in this page is strictly for the purposes of academic inquiry, comment, and criticism and is protected by fair use provisions of applicable copyright laws. All original essays are copyright © Andy Wood. This is version 3 of the Center.